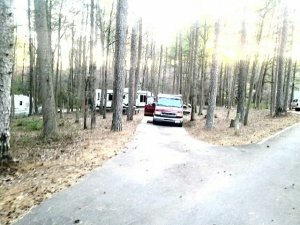 We arrived today after a long drive and hoped we would find a spot that would work for our 30 ft travel trailer. We knew we might have trouble based on the no reservation system. Directions through gate 2 were good and the guard sent us directly to the famcamp. The sign said to find a spot, set up camp and then go to the recreation office to pay for our stay. We drove through the campground and were so thankful we found one good spot. So we parked our rig, set it up - fighting with the misquitos - and then proceded to the office to pay for our stay. The young man behind the desk was pleasant and started taking our information and payment when a woman came from a back office and asked which spot we were in. When we told her, she said, "Oh, I am sorry but that spot is taken!" We couldn't believe it! This was supposed to be a first come, first served campground. It seems someone had already paid for that particular spot. She told us there were cones in that spot... and there were not. She also said the neighbors would have told us it was taken - in fact they told us it was open. In our opinion, this woman allowed someone to "reserve" a spot. We were so upset with this treatment that we packed up and left - although - we believe we had the right to stay. I intend to file a complaint with the Dobbins ARB services office concerning this incident. There are 279 listings and 10270 reviews.